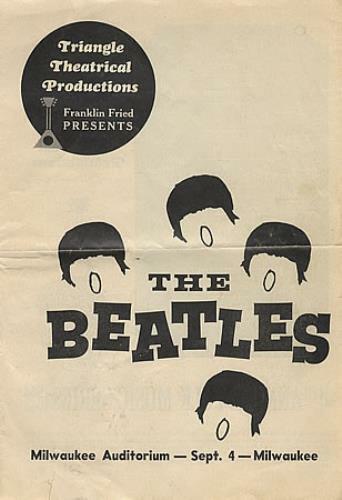 THE BEATLES Milwaukee Auditorium (Very rare one-off 6" x 9" 8-page programme for the Beatles' show at the Milwaukee Auditorium on 4th September 1964 issued by Triangle Theatrical Productions - completely different to the generic 'Beatles Ltd' programme sold across the August/September tour. See 'More Info' for further information and details of condition...). 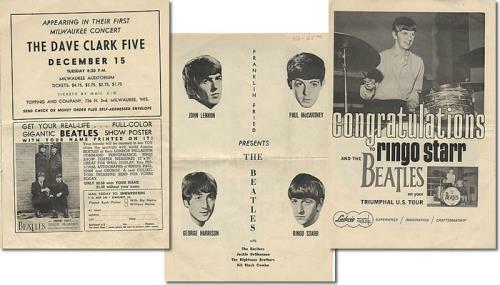 Tracklisting / Additional Info: For the Beatles' August/September US tour a generic 'Beatles Ltd' programme was printed - it was rare indeed for any of the individual venues/promoters to produce a supplementary publication for sale on the night only. Triangle Theatrical Productions printed such a publication for the 4th September show in Milwaukee and the following night's appearance in Chicago. This wonderfully evocative item features a great cover design with the band represented by four drawings simply of hair and open mouths! The date and venue is printed along the bottom edge with the promoter's logo in the top left corner. Inside, there are individual 'head' shots of the Fab Four [with John and George incorrectly captioned!] plus a list of the supporting acts - The Exciters, Jackie DeShannon, The Righteous Brothers and the Bill Black Combo. There are also advertisements for forthcoming attractions at the venue, a local music store, Coca Cola and McDonalds (yes, even then!) and a full page announcement from Ludwig offering congratulations to Ringo on the band's 'triumphal US tour' with a photograph of him in action behind his trademark 'marine pearl' kit. And there's a 'London Palladium' poster offer with coupon intact too! "There is no experience like the Beatles...That's about the only way to describe the English quartet's 'concert' Friday night. Flashbulbs exploded from so many parts of the jammed Arena (with an estimated 12,000 people in the crowd), it momentarily was brighter than daylight. The Beatles sang 'If I Fell'.Their fans already had." There is a 1" tear in the bottom edge of the cover, and a slight nick where the crease meets the opening edge. There are also small splits in the spine, however all pages are intact and the staples are secure and free from rust. The pages otherwise show only faint creasing with a couple of barely noticeable stains, no writing or discolouration! Overall, the defects present are only minor ones and do not detract from this superb original programme that takes you right back into the heart of Beatlemania American style! Record Label: Triangle Theatrical Prod.